Due to superior vigor, more adaptability to marginal soils, and greater tolerance to Phytophthora crown and root rot and water logging conditions, English walnut varieties on Paradox hybrid rootstock are the preference of most California walnut growers. The major disadvantage of Paradox rootstock is its high susceptibility to crown gall caused by the bacterium Agrobacterium tumefaciens. Galls consist of soft, disorganized tissue that lack the rings found in healthy wood or callus. Crown gall treatment is a costly and labor-intensive activity. 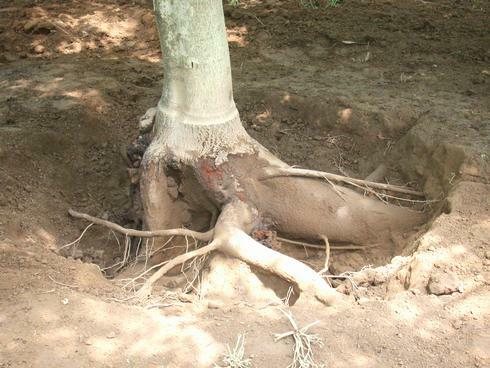 It can easily take one to two hours to remove soil and effectively treat a single tree. The preferred time to treat is during the growing season when bark surrounding the gall can be easily removed and treated areas can callus rapidly. Avoid treating after an irrigation or rain since the bacterium spreads in water. Early detection and treating small galls is preferable. As galls enlarge and develop inside major roots they become increasingly difficult and time consuming to successfully treat. The majority of galls occur below ground so the first step is to remove soil and expose galls for treatment. Shovels and pneumatic excavation are the most common soil removal methods. Shovels work well if only a few trees need treatment, but be careful not to damage roots or crowns and encourage additional infection. If gall development is extensive and many trees need treatment, air (pneumatic) is more efficient. Galls can be treated immediately after air excavation. For pneumatic excavation, we use commonly available air compressors and hoses, and attach precisely engineered nozzles which accelerate the air stream to twice the speed of sound (mach 2). This extreme speed is the source of power to drive the excavation process. Air jets are slower than pressurized water, but often more convenient. High ambient temperatures limit this system. Method #1. 90 psi at 150 cfm, 3/4 inch diameter hose with a mach 2 nozzle. Method #2. 90 psi at 330 cfm, 1 ½ inch diameter hose with a mach 2 nozzle. 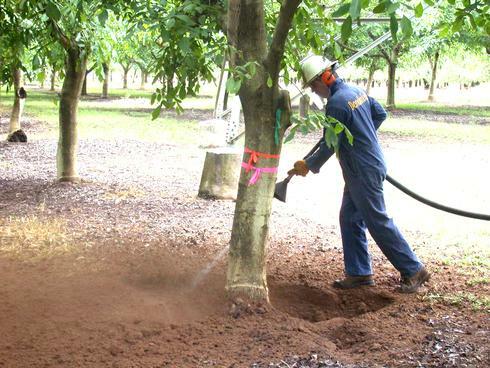 See the Walnut Research Report for information on pneumatic excavation. 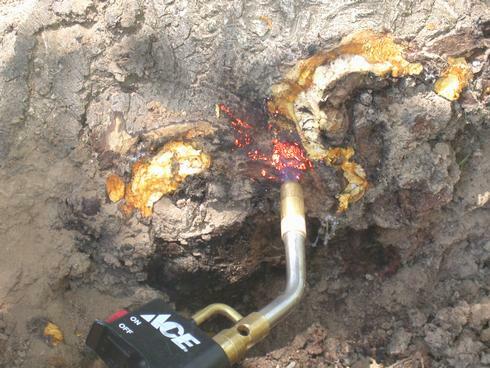 Using compressed air to remove soil away from the crown of a tree, in preparation for treating crown galls. Photo: J. Hasey. Once crown galls are exposed, removing the gall and the bark tissue surrounding the gall is the most effective treatment currently available. Treatments that kill or remove the bark surrounding the gall result in very good control. Research has shown that careful surgery is very effective. Applying liquid treatments did not improve control and may have reduced control by not allowing cuts to dry. Every gall is different and requires innovation and tenacity to eliminate. The best strategy is to use a hatchet and chisel, a sharp knife and a propane torch. The hatchet and chisel are used to remove the bulk of the gall tissue. This does not help control but it makes it easier to perform surgery around the gall. Use the propane torch to heat and sterilize the knife then cut and remove a one inch ring of bark from around the gall. Finally, use the torch to heat, dry and sterilize the one inch ring around the gall. Leave the treatment area exposed for six months and look for new galls missed by the treatment. Small galls at the margins can be quickly burned as they grow. Use caution in young trees as they are particularly sensitive to girdle damage from heat treatments. Flaming the tissue around the margins of a crown gall. Photo: J. Hasey. Adapted from the article “Crown Gall Treatment” by Richard Buchner, UCCE Farm Advisor Tehama County and Janine Hasey, UCCE Farm Advisor, Sutter, Yuba, Colusa Counties in the August 2009 Sacramento Valley Walnut News.